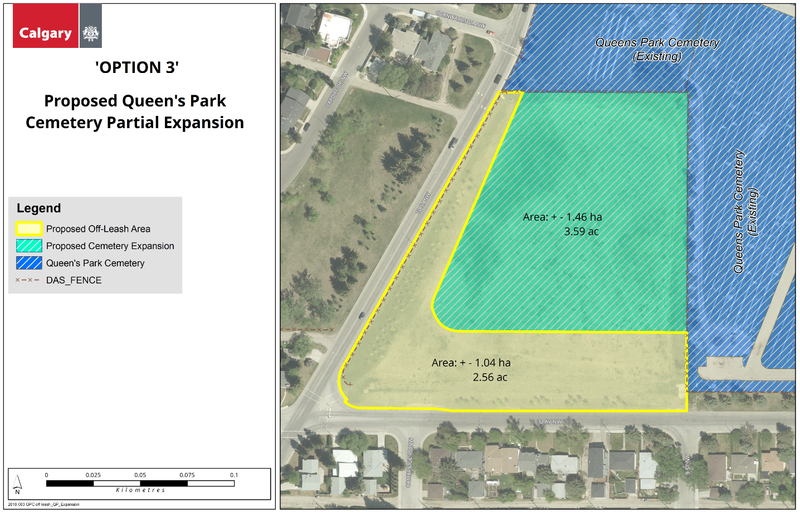 The Queen’s Park Cemetery is reaching its capacity and as a result Calgary Parks is planning to expand the cemetery into land currently used as an off-leash area. The Queen’s Park Cemetery has been serving Calgarians for nearly 80 years, and it is close to capacity. 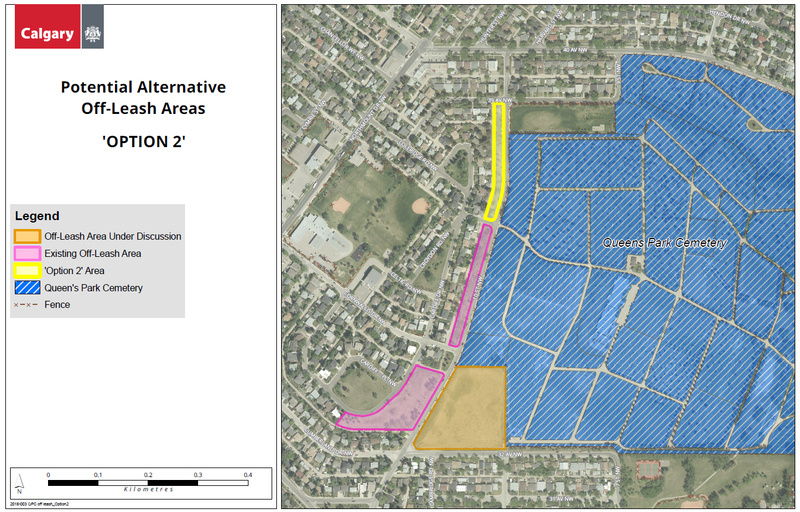 Calgary Parks is proposing to partially expand the cemetery into an adjacent site, currently used as an off-leash area identified below as they continue to look for a larger land purchase. The City is seeking public engagement input on options for alternative or improved off-leash areas, and landscaping options for the cemetery boundary. 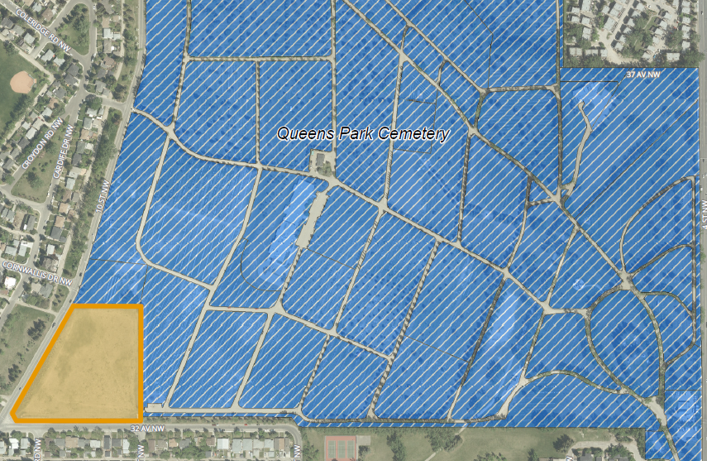 WHY IS MORE SPACE NEEDED AT QUEEN'S PARK? Queen’s Park is currently the only active City-operated cemetery, offering burial options for Calgarians in the northern quadrants. Pursuing opportunities to locate a new cemetery in the north area of the city for over ten years. Developing the new Southeast Cemetery, which will open in the next few years. It is important to Calgarians that we are able to continue offering adequate burial space. Expanding Queen’s Park would ensure we will be able to do so without interruption. There are several opportunities for alternative or improved off-leash spaces within walking distance. This could include one or a combination of the following options. Review the options and let us know your preference and comments. 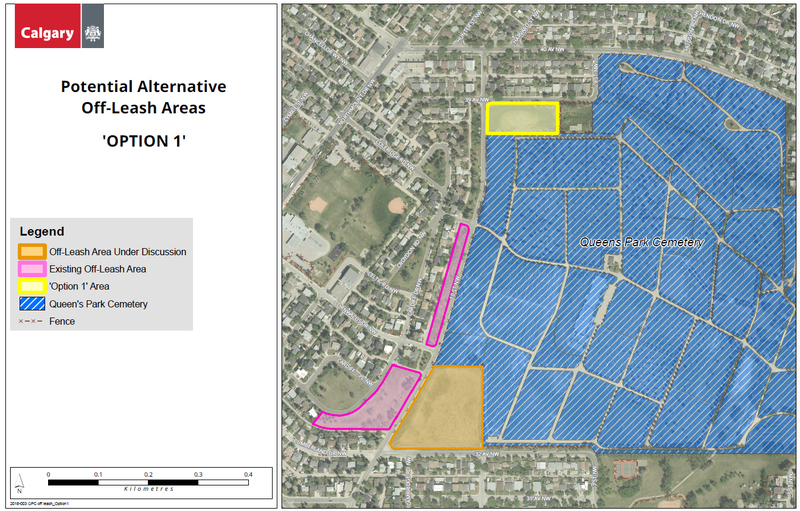 Option 1: Designate a portion of the existing park in the north-west corner of the cemetery (identified below in yellow) to be off-leash. This site includes a playground, which would be fenced off from the off-leash area. What are your opportunities/ hopes for Option 1? What are your issues/ concerns for Option 1? Increase public awareness and communicate to the community about the existing off-leash area (in pink). Designate the additional site (in yellow) off-leash. As with all options, there is an opportunity to have fencing at the site. Would you prefer to have a fence installed around the full site, around part of the site, or not at all? What are your opportunities/ hopes for Option 2? What are your issues/ concerns for Option 2? Option 3: Expand cemetery into part of the space, leaving a section as off-leash area (Identified in yellow). What are your opportunities/ hopes for Option 3? What are your issues/ concerns for Option 3? An expanded cemetery would have a fence like the rest of the site. However, there are several options for landscaping and screening. We could plant different kinds of trees, shrubs or a combination of the two. They could be densely planted to block views, or planted sparsely with more space between. Would you like shrubs or trees, or a combination of both along the boundary? If you prefer trees, would you prefer evergreen (e.g. spruce or pine) or deciduous (e.g. elm or ash) trees along the boundary? Would you prefer the planting dense or sparse? If you currently use the site, what activities do you use the site for? Feedback received during our engagement will be included in a 'What We Heard' report that will be shared publicly. The 'What We Heard' report will be included in subsequent reports to Committee and Council. From there, with Council's decision on this topic, we will move forward accordingly.